We recently published the VIP Newsletter for Q4 2018, containing trending topics, leading solutions, in depth technical articles, videos, webinars, and updates on next generation protocols. The newsletter covers content on PCIe 5.0, Arm® AMBA® 5 ACE5 and AXI5, CCIX and next generation MIPI and display protocols and applications ranging from AI, Cloud, Display, Storage and Networking. In case you missed the latest buzz on Verification IP, you can read it here. 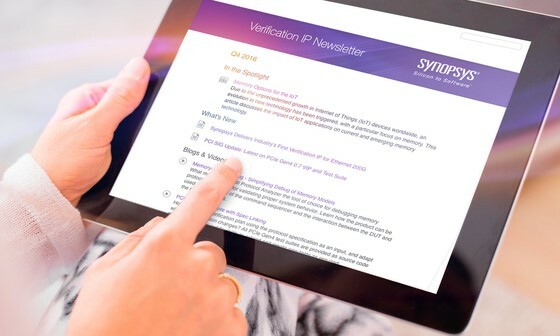 Synopsys supports 90+ Industry Leading Verification IP Protocols such as Arm® AMBA® 5, CCIX, DRAM Memory (DDR5, LPDDR5), Flash Memory, Ethernet (400G), MIPI, PCIe (5.0), SAS, SATA, USB(3.2, Type-C) and many more. 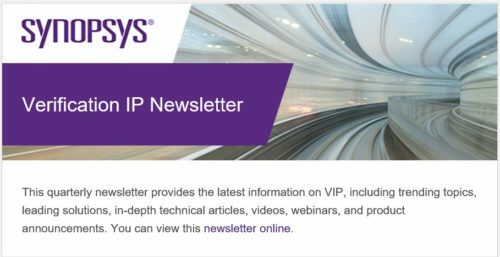 As an industry leader for complete VIP solutions, Synopsys is committed to providing you with the resources you need to accelerate your designs. Don’t miss the upcoming editions, subscribe to the VIP Newsletter today, and receive the latest information on VIP straight into your inbox every quarter. For a complete list of Verification IP and Test Suites, visit www.synopsys.com/vip. This post is filed under ACE, AMBA, Audio, Automotive, AXI, Camera, CCIX, CHI, Data Center, Debug, DesignWare, Display, events, HDCP, HDMI, Interconnects, Interface Subsystems, MIPI, Mobile SoC, MPHY, PCIe, Processor Subsystems, Soundwire, Storage, Test Suites, Uncategorized.